It wouldn't be a stretch of the imagination to assume that melancholy featured heavily in Honeymoon's concept. In a day and age where most things desired are located effortlessly, accessed immediately and consumed rapidly, a new full length record released in less than 18 months from an artist as high-profile as Lana Del Rey is pretty speedy indeed. Our first clue, the word "honeymoon", is a positive one. Its definition generally equates to the most memorable and romantic trip of a recently married couple. At the very least, it’s ‘the honeymoon period’, a short amount of time where blissfulness prevails. Del Rey’s fourth album begins with 30 seconds of strings so opulent and dramatic that it could easily be mistaken for the scoring of a pivotal scene from a '50s movie. Her rich voice melts the instrumentation as she purrs the title track over and over again, amidst a cocktail of retro-reverbs, slap-reverbs and distortion. "Music to Watch Boys To" is coquettish gender reversal at its best. Echoey layered vocals and innumerable guitar/keys effects over an authoritative drum beat creates a loose, airy ambiance. The video sees Del Rey mix old Hollywood with contemporary LA: neon signs, phonographic cylinders, skateboards, 35mm film reel and tattooed West Coast basketball players. The raw heartbreak bleeding from "Terrence Loves You" is gut-wrenching. A piano takes centre stage on this track and Del Rey croons like an authentic '40s jazz singer, driving the pace, but still gripping on to poignant moments. Somewhat out of the blue, British icon David Bowie receives a distinctive nod, when lyrics from his famous song "Space Oddity" are spliced into the mix in tribute. Sometimes, almost anyone can empathise with a musical subject matter. "God Knows I Tried" is one of those rarities. It’s not unusual for Del Rey to reference God in her back catalogue, in many different contexts; she still keeps us guessing about her beliefs of a higher power, as she dips her toe in the genre of gospel and adds a haunting edge. 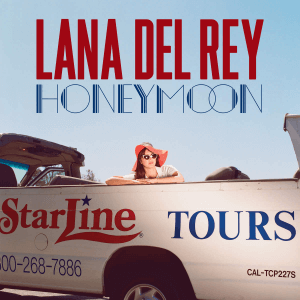 Honeymoon's lead single is the infectiously catchy and gratuitously-synthesised "High By the Beach". This lyrically repetitive and melodic power-pop number is an insight into how light and preppy Del Rey can be, against a trap-influenced beat. It’s the only explicit track on Honeymoon and Del Rey makes swearing shocking, as usual, with her nonchalant, glazed-over delivery. "Freak" shows off Del Rey’s impressive vocal range as the New Yorker sings about her adopted home of California and "art deco" references both the influential visual arts and her beloved "ghetto" over decadent sound collages. An extract from "Burnt Norton" by T.S Eliot is recited by Del Rey on its very own track. The significance is totally ambiguous, but the dreamy, stream of consciousness composition lying underneath it is enchanting. In "Religion" Del Rey breathily vows that love is her faith as pangs of electronica impede soft drums and the Mediterranean old world is revisited in the violin-infused "Salvatore", a part of the globe that Del Rey has been known to frequent in recent years, with her Italian lover. The record’s longest song is also its most powerful. ‘The Blackest Day’ recounts the excruciating break up of a relationship, and the tone to Del Rey’s voice is so emotive, it’s as if she’s nearly crying at points. She name-checks tragic songstress Billie Holiday; as if to, perhaps, draw a morbid comparison to herself. Thickly-concentrated, anthemic, swirly layers of multi-instrumentation plummet, ascend and peak into sophisticated crescendos like an aural fireworks display. The drama is back with "24", which begins not dissimilar to a high-octane Bond theme song and then matures into a piece of music that could have fallen straight out of Kill Bill; aided by an eclectic mix of percussion, a late bridge of pure humming adds a unique twist. The sombre "Swan Song" sees Del Rey pledge to never sing again. It’s both plush and suave. She’s virtually created her own genre of ‘music-noir’ at this point. Honeymoon closes with a cover of Nina Simone’s "Don’t Let Me Be Misunderstood". Del Rey changes nothing of the arrangement, but her voice warbles with a striking eeriness and there’s a definitive pain present: her signature stamp. The execution is stunning. Producing three major-label albums in four years has developed Lana Del Rey into an artistic innovator who fearlessly draws from style and substance across the past century, whose vision is completely original and not remotely predictable. Bring on the live dates, Lana.